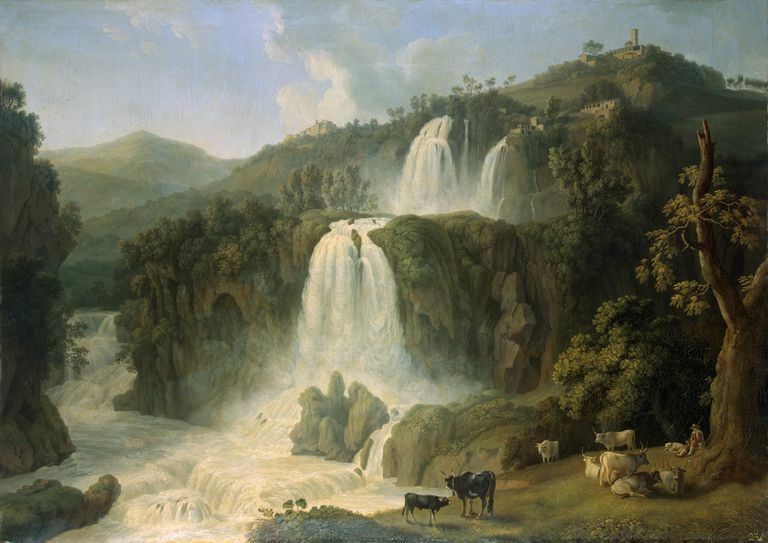 The Grand Cascade at Tivoli, 1783. Oil on canvas. 120 x 170 cm (47 1/4 x 66 15/16 in.). Landscapes are works of art that feature scenes of nature. This includes mountains, lakes, gardens, rivers, and any scenic view. Landscapes can be oil paintings, watercolors, gauche, pastels, or prints of any kind. Derived from the Dutch word landschap, landscape paintings capture the natural world around us. We tend to think of this genre as majestic mountain scenes, gently rolling hills, and still water garden ponds. Yet, landscapes can depict any scenery and feature subjects within them such as buildings, animals, and people. While there is a traditional viewpoint of landscapes, over the years artists have turned to other settings. Cityscapes, for instance, are views of urban areas, seascapes capture the ocean, and waterscapes feature freshwater such as the work of Monet on the Seine. In art, the word landscape has another definition. "Landscape format" refers to a picture plane that has a width which is greater than its height. Essentially, it is a piece of art in a horizontal rather than a vertical orientation. Landscape in this sense is indeed derived from landscape paintings. The horizontal format is much more conducive to capturing the wide vistas that artists hope to portray in their work. A vertical format, though used for some landscapes, tends to restrict the vantage point of the subject and may not have the same impact. As popular as they may be today, landscapes are relatively new to the art world. Capturing the beauty of the natural world was not a priority in early art when the focus was on spiritual or historical subjects. It was not until the 17th century that landscape painting began to emerge. Many art historians recognize that it was during this time that scenery became the subject itself and not just an element in the background. This included the work of French painters Claude Lorraine and Nicholas Poussin as well as Dutch artists like Jacob van Ruysdael. Landscape painting ranked fourth in the hierarchy of genres set up by the French Academy. 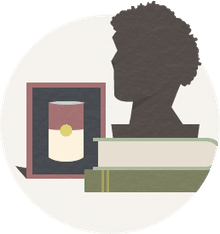 History painting, portraiture, and genre painting were considered more important. The still life genre was considered less important. This new genre of painting took off, and by the 19th century, it had gained widespread popularity. It often romanticized the scenic views and came to dominate the subjects of paintings as artists attempted to capture what was around them for all to see. Landscapes also gave the first (and only) glimpse many people had of foreign lands. When the Impressionists emerged in the mid-1800s, landscapes began to be less realistic and literal. Though collectors will always enjoy realistic landscapes, artists like Monet, Renoir, and Cezanne demonstrated a new view of the natural world. From there, landscape painting has thrived, and it is now one of the most popular genres among collectors. Artists have taken the landscape to a variety of places with new interpretations and many sticking with tradition. One thing is for sure; the landscape genre now dominates the landscape of the art world. Why Did Artists Paint Skulls in a Still Life?